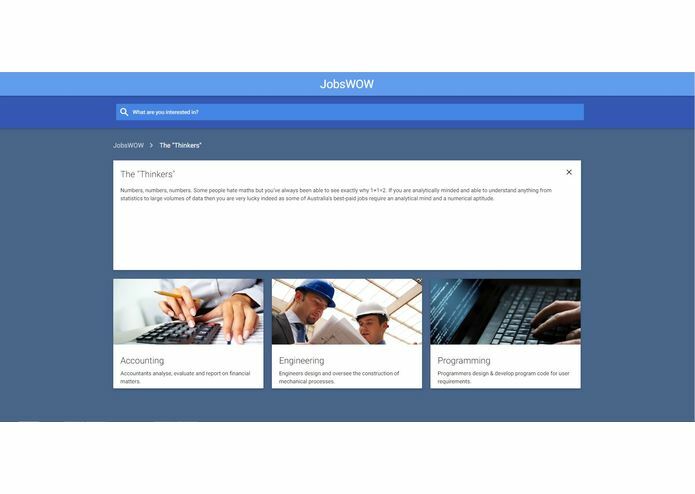 JobsWow is an online platform that connects job seekers to career paths, employers and jobs in their community. 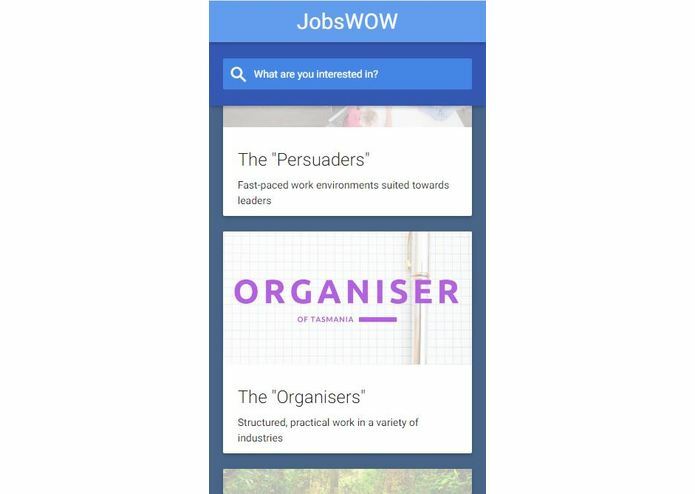 JobsWow is an online platform that aims to connect job seekers and the curious minded to career paths, employers and job vacancies in their local community. The concept of JobsWow was born from a desire to address one of the largest issues affecting Tasmanian growth; Youth Unemployment. Youth unemployment in Tasmania is, at a state level, amongst the highest in the country at a staggering 19.6% in January 2016. Currently, in Tasmania, only 25% of Year 10 students continue on to complete Year 12 studies. In conjunction with this, the majority of domestic intake to the Univeristy of Tasmania is mature aged students (23+); there is growing concern that students are leaving school early to find themselves either unable to find work or in an occupation that they eventually leave and return to their studies at the tertiary level. Additionally, at current there is a large disconnect between the education system and the job market. There is little to no interaction between employers and those within the education system excluding established graduate offerings from large corporations and scarce internship programs. The information that is made available to job seekers is difficult to access and many resources are biased in their services, offering information that has been tailored to suit vested interests of an education provider or employment agency. 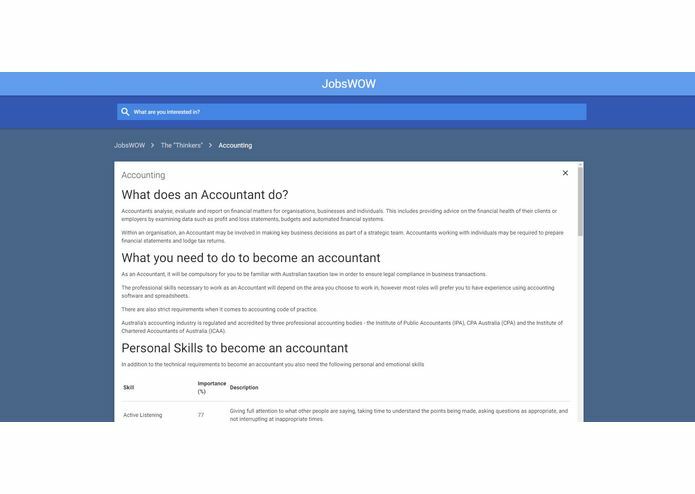 JobsWow connects users with training courses/institutions that are in their area whilst also providing them with user reviews of the course being offered. 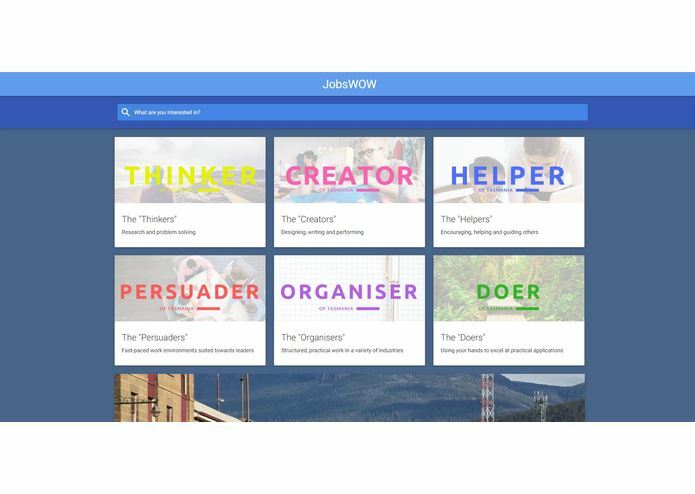 JobsWow is unique in Tasmania and Australia in that it provides users with an intergrated platform where they can assess their interests and skills, browse what occupations use their particular skills and then see available job listing or links to relevant training information. All of this is completed in the one application within only a few clicks of the homepage. JobsWow's integrated platform replaces several competition services that seek to answer only half the problem or provide biased information and potentially only offer training courses that they have a vested interest in rather than suggesting what would best suit the user. JobsWow was developed not only to provide a solution to a genuine community need, but to conform and to address the University of Tasmania's research goals for creativity, culture and society. 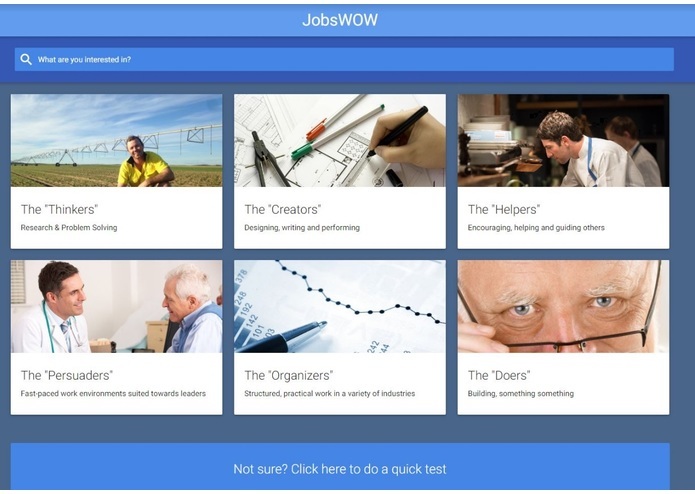 JobsWow draws it's data directly from Australian Government databases provided from the Department of Employment based on providing in depth information and pathways for over 350 individual occupations. JobsWow takes this data and displays it in a user friendly platform that is efficient and enjoyable to use. Our primary target market/end user is high school students currently in Year 9 or Year 10. By providing students with the tools they need to be able to identify their skills and interests and how that links with potential career paths, JobsWow hopes to eliminate the confusion that students face when considering the future for their education. Our secondary target market is the employers and learning institutions. Based on what users select as their skill set and area of interest we are able to build a complete profile for employers and institutions to not only access for recruitment but provide critical feedback on potential gaps in their offerings or areas of potential growth. 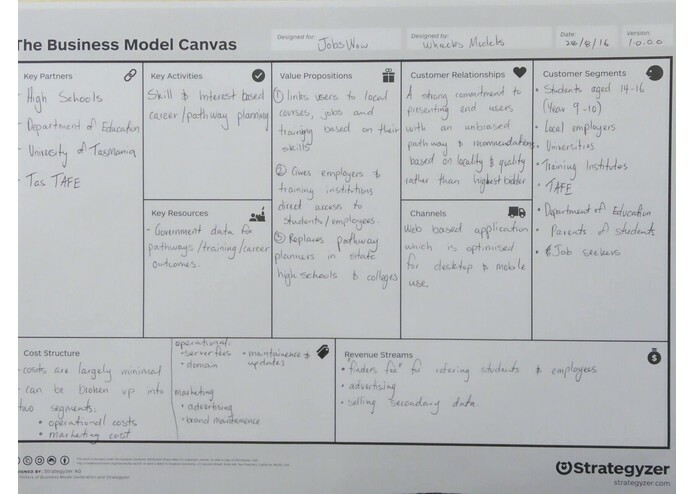 We developed using an agile method, designing and implementing features as required. Our focus was on creating a simple and easy-to-use interface, so ensuring that the interface was aesthetically pleasing and functioned correctly were top priorities. As we iterated over the client interface and started adding more features, we were spending quite a lot of time rewriting code to implement wanted features or just avoiding features all together due to the substantial amount of time that would be required to implement those features which would then detract from the amount of time that we would have to be adding the actual content of our project to the application. 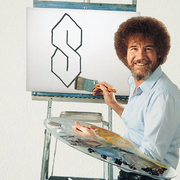 Initially some rewrites were being done to further accommodate additional features, we got to a point where it would be substantially time consuming to be constantly reiterating over the application so we just started to only implement the core features for the app and leave out anything extra where possible. In its current state, JobsWow requires students to self assess what they perceive to be their relative strength or personality type. This is not idea as we are essentially targeting students who already feel lost in regards to their skills and what they should do next. To address this gap in our service we plan to implement personality based skills quizes into the assessment process such that if the student does not know what category they fit into, they can complete the short quiz for some guidance. A user clicks that they are interested in computing JobsWow will give them Facebook links to interest groups such as: UTAS Computing and Technology Society, TasGDS, StartUpTas, UHack 2016 event page etc.